Looks like its the end of 7n6! USAC Sales (large importer of 5.45×39 7N6) just posted this up on their site – http://www.usacsales.com/index.php?route=information/news/news&news_id=14. Unfortunately the rumors are true, the ATF has banned any further importation of Surplus 5.45X39mm ammunition in to the United States. Please do not contact us with questions regarding the ban, all the information we currently have is posted in this article. We will update is as soon as we know any more information. All surplus 5.45x39mm contains a steel core of varying hardness depending on its year of production. Although this ammunition does not reach the standards to be classified as “Amor Piercing” or “AP”, no ammunition may be importable with a steel core if there is an available handgun to be purchased by the civilian market that will fire that round. 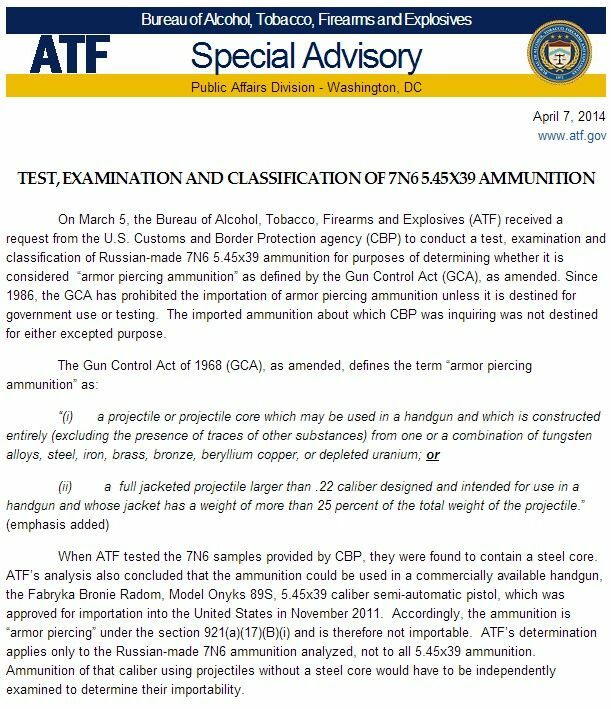 It appears that someone created a 5.45x39mm Pistol, therefore the ATF has ruled that no further importation of this ammunition shall be approved which contains a steel core. All new production of this ammunition does NOT contain a steel core and therefore will continue to be produced and or imported and sold in the United States. This is the same scenario which occurred with the Surplus 7.62×39 many years ago when the ATF banned the import of that round as well. All current stock of 5.45x39mm, including private collections can still be sold, traded and used in your weapons. The ban is strictly on the importation of this round. Most companies, including ourselves sold out very quickly yesterday (3/29/2014) when this news became available. There are currently a few websites on the internet that continue to have inventory. We are currently in negotiations to procure more of this product which currently resides in the United States. We will keep you posted if we are successful at this.